These days most global businesses require English communication via email. Business emails require special attention as they need to include a certain level of professionalism and formality. Over the years we have helped thousands of ESL students improve not only their general English skill, but their English writing for business purposes. Today I want to take some time to discuss writing business emails. When composing a business email it is very important to know your audience and be clear of the specific purpose of the email or the email thread. The tone in which you write your email dictates the way that your company is perceived. Sometimes being a little less formal is okay, but always stay professional. Think about the reason that you are writing the email in the first place; are you requesting a service, negotiating a price, discussing a complaint, or planning an event or trip? Do they need you, or do you need them? Will there be multiple recipients? All of these factors, and more, should factor in to the tone and style that you choose. In a business email one needs to be direct, clear, concise, and to the point; all while maintaining a strong and positive image. Remember, you are not in business purely for pleasure (at least most of us aren’t) and you have a mission to achieve and a bottom line to watch. Note, I kept it short enough that the reader can read the email subject on his outlook, apple mail, phone, or any mobile device. This is a debated point. While it is true that emails are generally less formal than traditional letters, they still need to show respect. Depending on the the level of formality you may choose to use a title with the greeting “Dear”. We usually use Mr. for a man; Mrs. for a married woman; and Ms. (pronounced Mizz) when we don’t know, if we are not sure, or the woman chooses this title; and sometimes Miss for a very young woman although this would be very rare, unless of course you are writing to Miss Jackson. Although it is sometimes acceptable at times to use a semicolon (;) or colon (;) after the greeting, when we write emails we generally use a comma (,). Even though business emails are supposed to be concise, this does not give the writer a license to skip any form of politeness or formality. Choose a sentence which introduces the topic that you are writing about while having a professional tone. Thank your for your interest in our Business English Courses. Thank you for contacting Language On. I am writing to inquire about your Business English classes. Could you please send me some more information about your Business English lessons. Be concise: Being clear is important in business, but it also makes it easier to write and you wont have to worry so much about grammar mistakes. Don’t give unnecessary information: Keep the email on track and only include the necessary points. Use appropriate spacing: If you need multiple paragraphs, then make sure that you leave a space between them. Ask questions in a list: Chances are the person you are writing to has many emails to answer that day, so consider asking your questions in a list form. If you are responding to questions consider using a different color and answering below each individual question. State the attachments: Make sure to clearly state the attachments which you have included. This will keep the recipient from guessing what they think was included, or what may have been forgotten or gotten lost on the world wide web. No matter what your Business English book might say it is not very common to end an email with anything more formal than “Sincerely,”. If you want to get more formal than that you should probably be writing a letter and be living pre-1970s. But again, that is just my opinion, and you know what they say about those. People choose their own “close” and usually tend to stick to them for one reason or another. Any one of the following should be fine, and always make sure to use a comma (,). You are almost finished! Make sure to leave your name and your contact information underneath your closing. If you don’t have one, you may want to create a standard email signature to use on all of your emails. You can include your name, signature, company, contact information, logo, and pretty much anything else you want, except the kitchen sink, of course. 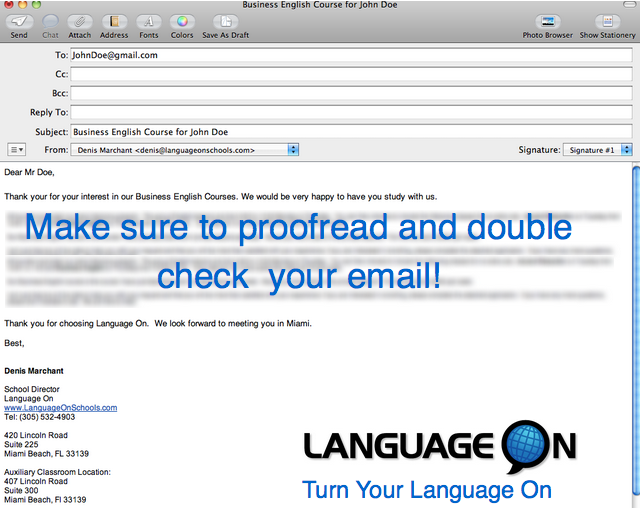 Last, but not least, make sure to proofread your email and check for grammar and other general mistakes. All good? Then send! ⇒ Now it’s time to send us an email! Do you have any questions about English or Accent Reduction? Let us know, we are here to help. Turn Your Language On! Instruction for Business English is provided by Premium Languages, the private tutorial, foreign language, and test preparation partner of Language On. Courses provided by Premium Languages are not accredited by CEA and do not qualify for F-1 (student) visas. Interesting, just ended reading through this blogpost. Very wonderful articles you got there. Surely following your site! Thank you for everything. Interesting, just finished reading this post. Very nice articles you got there. Definitely following your blog! Thank you for everything. nice info you got there, i found this site from my friend computer and good things this is a good site. Hello it’s mе, I am аlso visiting this weƄsite daily, thiѕ site is truly fastidious and the users arе really sharing good thoughts. I aⅼways ѕpent mｙ half an hour to read this blog’s articles every day along with a mug of coffee. Hurrah! After all I got a blog from where I be able to really obtain helpful facts regarding my study and knowledge. for ρeople knowledge, well, keep up the nicｅ work fellows.